Here, for your FC-ing pleasure, is the sensational She-Hulk. 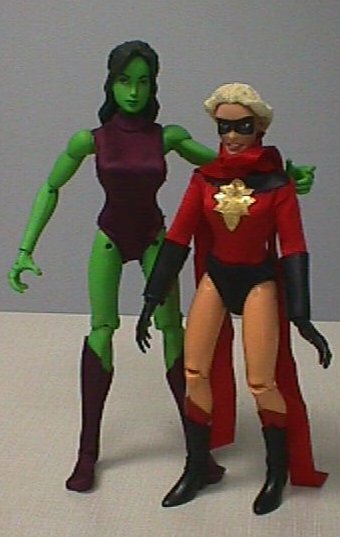 Here we see Shulkie standing beside Ms. Marvel, who's a standard, off-the-rack FC Female. The longer calves give her the taller stature I thought she needed, and the sculpting on the arms and shoulders -- although a little less articulated than your standard FC ball joint -- helps give her a more powerful look. The face is Fairchild's, with hair from Anij. I'm not wild about it -- it's not really "her" -- but it will do for now. Shulkie is a bit more "built" than many a super-babe, and the Fairchild torso let me recreate that. As you can see, the knees are fairly ugly from behind but do have some level of articulation. 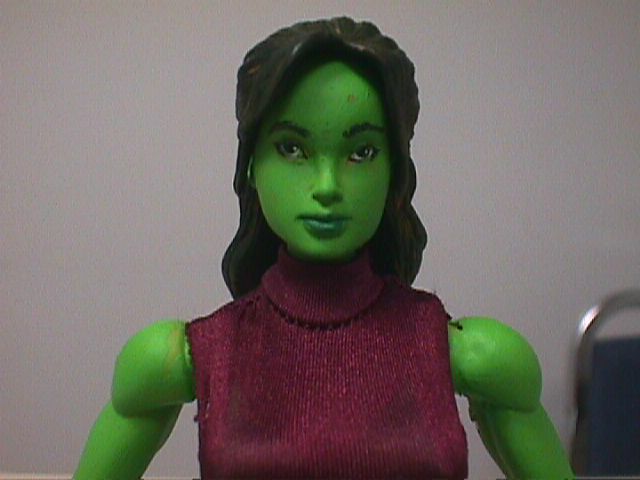 Shulkie is the upper torso, arms, head, lower legs and feet of the 12" Gen13 "Fairchild" figure with the waist-ball, lower torso, and thighs of Rogue, and the hair of "Star Trek: Insurrection"'s "Anij." Much green paint was applied. The costume, really a temporary throw-together, is the butchered remains of a Dark Phoenix jumpsuit.